I really liked this week's Make it Monday #34 technique that showed us how to make homemade thick chipboard accents. It is so easy. Basically, you just die cut your cardboard (I used coasters) 6 or so times, then glue all the layers together. I used it again to make another birthday card for my daughter, who's birthday is next weekend. I went back to Kim's blog to case the same card I cased here. I was inspired to make the numbers out of chipboard by this card by Euna. You can see how thick those numbers are. A little peek at the inside of the card, where Rachel will find another cupcake. I just love this sentiment from SU Create a Cupcake--it pretty much sums up Rachel's philosophy on life. My baby is turning 14 soon, and I am making a few things to surprise her. Here is one of her birthday cards. I cased this card from Deb at My Craftroom Creations. Deb's blog is pretty new, and I am so glad she has started posting her creations, because I have gotten several good ideas already from her. That beautiful patterned paper in the background is another pattern from PTI's Funky Town, a gift from my friend Kim from Cupcakes, Cards and Kim. She has lots of great creations on her blog, too. Rachel loves opening the card and seeing a bit inside as well, so here is a peek at the inside. The sentiment is from Verve's Birthday Bash, my all time favorite Birthday set. 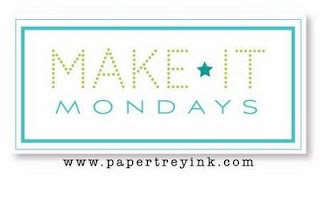 This week's Make it Monday showed us how to make homemade thick chipboard accents. It is so easy. Basically, you just die cut your cardboard (I used coasters) 6 or so times, then glue all the layers together. The top layer is the card stock or patterned paper you want to show on your card. 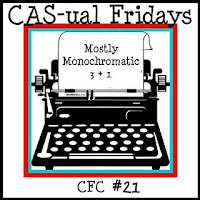 This week's CAS-ual Friday's Challenge is called Mostly Monochromatic, and the challenge is to use three shades of the same color plus brown. I combined the two challenges into this card, using Scattered Showers. It is based on a card Dawn McVey showed during the initial introduction of Scattered Showers back in 2009. I used Bitty Dots paper in Sweet Blush, Hibiscus Burst, and Raspberry Fizz. I used the Sweet Blush umbrella for my chipboard accent. In this side view, you can see how thick that light pink umbrella is. This technique is so easy, and really adds something special to the card. I've got lots of ideas for more chipboard fun. I didn't intend for this card to be a baby shower card for a girl, but that's what it is looking like to me. So, I think I'll be hanging on to this one for a while. Here is a fun card and matching gift tag my daughter gave to her friend last week. I originally posted this card on my Splitcoast Stampers Gallery when I first made it, but I am posting it here because I finally used it. I cased it from this card. My sweet friend Kim from Cupcakes, Cards and Kim sent me some super cute paper, and then posted a card for me to case that was perfect for the paper. It doesn't get any easier than that, and this card for my little niece came together in a snap. I used sentiments from Big Birthday Wishes, By the Numbers and Edgers dies, and a Nestie for the circle. I still might add a bit of bling before I send the card out next month. I used one of my favorite stamps from Background Basics Retro to stamp something linear in the colors I saw in the photo. Very simple. I interpreted the door as a greeting, and used part of one of the Think Big Favorites to stamp 'hello'. All my cards this year used Rustic Cream, Ripe Avocado, Simply Chartreuse, or Terracotta Tile. Since I couldn't settle on one design, I just made a few of each, and am trying to keep track of which card I sent to each person. All these cards use Mazel Tov, and either the Woodgrain IP or Mehndi Medallion IP. I stamped a shofar image on the outside of the envelopes. This week's Make it Monday topic is 'Frosted Images' I am posting the card I made using this technique, although after looking at this card, you would be forgiven for thinking that the topic was 'Smudged Images'. I had a hard time with this one, and I think I ruined my Fresh Snow ink pad in the process. Oh well. Here is a close up of Rachel's card. She chose to use the Chevron Strips as her background, and colored each ice cream scoop with Copics. Doesn't that look yummy. I think she is a great little card maker? She chose a sentiment from Paper Smooches. I think her card is the best, don't you? Here is a close up of one of the cards I made that day. I used my Market Street Stamps Zebra background, stamped in various colors and embossed with clear embossing powder. The sentiment is from Asian Fusion. The cherries on top were made with the SU Create a Cupcake punch--they are probably the thing I use most from that punch. And, because my daughters both told me that we need more cards that they can grab on short notice and give to their friends that DON'T say things like 'you're so sweet' and 'hi there sweetie', I made a couple more of these giant ice cream cones, that I first showed here, and was originally cased from Katie's card here. The sentiments are from Paper Smooches, and have been approved by both my girls as being not too mushy. After our ice cream card making party, we both sat down to a nice big bowl of ice cream. It was a sweet day. I have three more mini cards today--these are also sized to fit the Seed Packet Die, 2 1/2" by 3 1/2". These cards are for the CAS-ual Friday challenge #20 to make a mini card, and also for the CR84FN #38 color challenge of bright pink, black and grey. I used PTI Hibiscus Burst cardstock, Bitty Dot patterned paper in Hibiscus Burst, and black and grey inks. The cards are made with Mat Stack #3, using the method Monica describes here. They will each fit an envelope made with the Seed Packet Die. In front of each card, you can see the little sticker I made to match each card, that will be used to keep the envelope closed. To make the sticker, I used a PTI adhesive sheet cut with a Beautiful Bloom die and stamped with either Gingham, Bitty Background Blocks, or Flower Fusion in Versa Color Rose Red, which is my best ink match to Hibiscus Burst. Here are some individual close up shots. I have two more mini cards today--these are sized to fit the Seed Packet Die, 2 1/2" by 3 1/2". These cards are for the CAS-ual Friday challenge #20 to make a mini card, and also for the CR84FN #38 color challenge of bright pink, black and grey. I used PTI Hibiscus Burst cardstock and black and grey inks. I was inspired by this card set. I used the Mehndi Medallion stamp in Grey, 'thank' and 'Love' in black, and wonderful words 'you' cut out of Hibiscus Burst cardstock. So far, I am finding things in my stamping stash to work with the Wonderful Words dies, but I love those dies so much, I will probably end up buying them their own stamp set at some point. I thought these cards would look cute inside a mini envelope made out of vellum, and made a sticker to keep the envelope closed. To make the sticker, I used a PTI adhesive sheet cut with a Flower Fusion die and stamped with one of the smaller Mehndi stamps in Versa Color Rose Red, which is my best ink match to Hibiscus Burst. I just got the Wonderful Words dies and was eager to play with them. I didn't get the stamp set, because I wasn't sure how I would like the dies, and I thought it would be a good challenge to see what I already had that would work with the dies (crazy, right?). I decided to play along with this week's CAS-ual Friday challenge #20 to make a mini card. Lately, I have been loving mini cards. 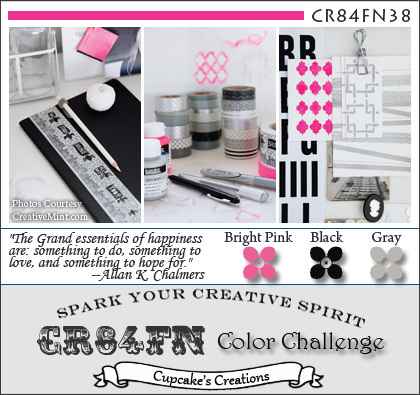 This card is 4X4 and is also for the CR84FN #38 color challenge of bright pink, black and grey. I used PTI Hibiscus Burst cardstock and black and grey inks. I used a technique explained a while back on a Make it Monday where we were challenged to make a background out of sentiments from different sets. I needed something to go along with that loopy pink 'happy', so I used the 'Birthday' sentiment from Big Birthday Wishes, Ad Sense, Wonderfully Whimsical, and Up, Up, and Away. The two 'Birthday' sentiments closest to the 'happy' are in black ink. The rest are in grey. I made these cards a while ago, before I had a blog. I thought I'd post them now, as one of them finally got used and sent. I was inspired by this card. I loved the play on words and the musical background, and, of course, Little Bitty Bird. Here is another similar card I made, that I already posted on my now abandoned Splitcoaststampers Gallery. When I have nothing new, I am going to post some of my favorites from over there. This is the second card I made for the ColorQ Challenge #102. I used a color combination of Spring Moss, Poppy Parade, Smokey Shadow and Hawaiian Shores. This card has Hawaiian Shores as the main color. The first card I made had Spring Moss as the main color, and I was wondering if it might look better with Hawaiian Shores as the main color, so I made this one. You can see the other card here. It's a big year for many of my friends, myself included. I decided to make a couple of birthday cards to celebrate the occasion for the last of the gang with fall birthdays. 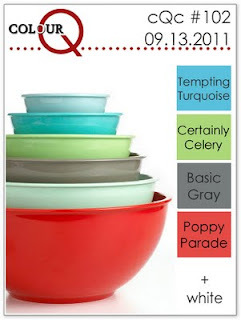 I let the ColorQ Challenge #102 guide my color choices--this palette is so gorgeous. I used a color combination of Spring Moss, Poppy Parade, Smokey Shadow and Hawaiian Shores. This card has Spring Moss as the main color. I was wondering if it might look better with Hawaiian Shores as the main color, so I made another one. It will be in the next blog post, since I have learned that I need separate posts for each card I enter into a challenge. It is time for our September Four-of-a-Kind post. This will be the second in what I hope is a long series of monthly posts where Cathy, Kim, Renee and I challenge ourselves to make a card out of a kit sent to us by the hostess of the month. You can see the first challenge here. The hostess for the month makes four kits and sends them out to each of us. We work secretly to create a card using at least 4 items from the kit. No other rules or restrictions. We are allowed to use anything else we have on hand. We get to see each others cards today, on each of our blog posts. We are scheduling our posts to go live at the same time. I can't wait to see what everyone has created. I am really happy with the way this card turned out, and it didn't take much time at all. I think having a collection of elements all prepared and practically served to me on a silver platter is quite a nice way to make a card. Please stop by their blogs, if you haven't been there already, and see what they have created for our second Four-of-a-Kind post.